Of course, there's the kale, which is bright and happy and lovely in there, and made all the more tasty with the addition of a little lemon, garlic, some chili flakes and parmesan cheese. But yeah, it's the roastedness of the almonds that makes it ever so irresistible. And then I made these crostini for lunch in which you spread ricotta cheese on grilled bread, then sprinkle with salt and fresh cracked pepper. 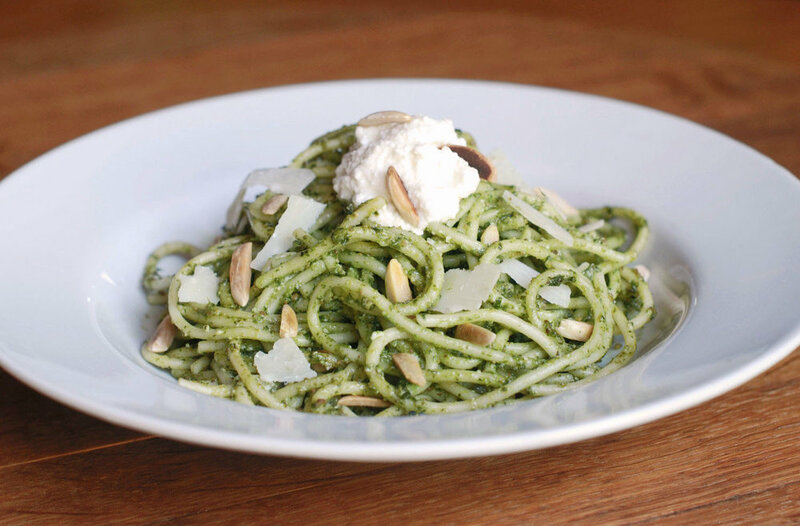 Top that with some of the kale pesto, some shards of Parmesan cheese and a sprinkling of toasted almonds. Grind on a little more cracked pepper if you like and prepare to love life just a little bit more than you might have otherwise. This recipe is an amalgamation of several that I've come across online. I switched things up a bit more to create a super flavorful sauce without the hefty dose of calories found in most pestos. We're not real crazy about the sharp bite of raw garlic, so I threw the garlic clove in to blanch with the kale and that did the trick, giving the pesto just a hint of garlic. If you'd like more garlic presence, just throw another clove or 2 of garlic in the blanching water. To blanch the kale, place it and the clove of garlic in a pan of lightly boiling, salted water for 3 minutes. Drain (reserving a cup of the cooking water) and place in ice water. Squeeze dry. Place the almonds on a small baking sheet and roast for 7-8 minutes or until almonds are golden brown. Place the almonds in a food processor then add the kale, garlic, chili flakes, lemon juice, salt and cheese. Process until roughly chopped, then drizzle in your olive oil. Continue processing until you have a fairly smooth pesto. You can add some of the kale blanching water to loosen the pesto if you like. Taste it for salt or more cheese or even more oil, the pesto should have a nice movement to it when stirred. For the pasta I just mix a little ricotta cheese and salt in with the pesto and mix that with al dente pasta and some of the pasta cooking water until I have a nice sauce. As I said, I top it with a little more ricotta, parmesan cheese and toasted slivered almonds.